Made of crystal clear PET plastic for optimal product visibility, the Polar Pak 2409 1 compartment clear muffin takeout container is created to increase impulse buys in your bakery or cafe! The crystal clear material allows you to set up eye-catching displays of individual cupcakes or muffins that are designed to entice guests into making a quick and easy single-serve purchase to satisfy their craving! The 1 compartment configuration makes choosing a single fresh, fluffy muffin or decadently decorated cupcake a tempting and convenient impulse buy! Our customers absolutely loved these containers! They made it easy to package cupcakes and muffins quickly and gave the product a more finished overall look. These containers are perfect for bake sales or individual servings at a party. They are also great for little take home gifts. They are slightly hard to open, but easy to close. I would still recommend! These are great for transporting and displaying jumbo cupcakes or muffins. They are also stackable. Since they are clear people know exactly what is in it. I absolutely love these containers for my bakery. Our jumbo cupcakes fit perfectly in them and the icing doesn’t get messed up on them. I highly recommend these sturdy containers! Perfect takeout container. We use these containers for our lemonade stand when we sell cupcakes. The cupcake fits perfectly into the container. Roomy. Excellent presentation! Definite re-order. These one compartment cupcake containers are great for individual cupcake sales. They are a bit wide for a regular sized cupcake but are great for jumbo cupcakes and muffins! Height is perfect for tall frosted cupcakes. This is the perfect container for regular sized cupcakes. We have tried different containers and a lot of them are for the jumbo size. If you are looking for a non flimsy regular cupcake container, this is it! These 1 compartment high cupcakes are great for craft fairs when selling cupcakes and muffins. They are also great for jumbo cupcakes. They fit here as well. Fits one cupcake nicely. It sometimes moves around a little bit but that could just be a size difference between the container and the cupcakes themselves. However the lid stays tightly shut and you can see the product inside very well. These are great little containers. We have used them for really a variety of baked goods. Muffins, cupcakes, multiple sets of cookies. You really can use them for anything. They close nicely and stay closed as well. Switched from a different style and these work so much better for stacking containers together, I won't buy my containers from anywhere else for my business. These are perfect! They come apart easily from each other. They close tightly. Keep the height in mind - they work great for almost all of our cupcakes, but a couple are a little too tall for these. The base of our cupcakes fit in these perfectly - enough room that you can easily get them out, but not so much that they move around a bunch. I use these containers every week at the farmer's market for customers who want to take their cupcake on the go. The built-in cupcake insert prevents any damage done to the cake or frosting even when shaking occurs. Great quality and a lot of product for a great price! We swapped to these clear containers trying to cut packaging costs. We have been very pleased with them. We add a sticker with our logo to the top and they look great and are cost efficient. Just the right size for either jumbo cupcakes or muffins! The container is tall enough to really pile on the frosting and still not squish the product. They were perfect for my single cupcake orders. Used them for Easter orders in baskets. I will continue to order in the future for my cupcake orders. I love these single cupcake boxes. They are perfect for single sale items like muffins as well. I also use them for my donations and I can easily stack them up in a box without worrying if the frosting will be mess up. I use these for jumbo muffins, single cupcakes and also some of my desserts. They are versatile for a number of things. They open easily and are great quality for transporting. The single jumbo muffin containers are awesome !!! I have been using several different cupcake containers and I finally came across the perfect containers ! They are easy to use as well as transport! Them being clear is a plus ! These were a GREAT buy and I highly recommend them to anyone looking for cupcake containers !!!! These are much more economical than my local options for single containers. We use them for our jumbo blueberry muffins but we've also had to use them for cupcakes in a pinch and they work great. Tall enough that the icing doesn't get smooshed when I close the container. I love these 1 Compartment containers. They hold a standard cupcake in a tulip liner well or a jumbo cupcake/Muffin in a standard liner. You can stack these about two high. We use these for takeout cupcakes at our store. We used to put them in boxes and these look way way nicer! Really great product. These containers are sturdy and keep the item fresh. I only gave the item 4 stars because i purchased them thinking it would be a good container for a standard sized cupcake, however when I received them they were larger than I expected. These containers are perfect for jumbo size cupcakes. A standard size cupcake looks very small inside these containers. So I just had to change the size up the cupcakes to jumbo and it worked out great.. I actually just delivered my first cupcake in this packaging and I have to say, it was very easy to transport and it opens and closes nicely. These bucket containers are great! They can fit our standard cupcakes, as well as our jumbo muffins. I love and keep buying them!! L H.
These one compartment containers are great! They can fit our standard cupcakes as well as our jumbo muffins. The high hinged top gives plenty of room for our frostings too. Love these single pack cupcake holders! They hold the cupcakes without smashing the icing! Will definitely be purchasing again! I've gotten lots of compliments on how nice they look! These containers work great for cupcakes or muffins they are easy to personalize if you want to and even work with a taller tulip style cup cake liner. I purchased these containers to use at a bake sale. They were simple to use and made it easy for customers to take individual cupcakes. These are perfect for my jumbo size cupcakes and also regular size too. They have the High hinged top so that way nothing will get smashed, and it also gives you plenty of room for them as well. They are very sturdy which makes transporting easy and it's not flimsy at all. Amazing and Great Quality! My daughter recently started a project she calls Blossom's Cupcakes for a Cause. She has been baking up a storm in our kitchen to make cupcakes she offers as a gift to supporters donating to a charity of her choice. The 1Compartment Clear OPS Hinged Cupcake packaging we found from Webstauraunts.com has worked out perfectly! Fits standard size cupcakes nicely with plenty of room for frosting. Keeps them secure for traveling and packaging feels sturdy. We'll be using these as she heads out to farmer's markets and other events this summer. These to go containers are perfect for cupcakes and muffins. The opening is bigger than needed for most of our cupcakes, but they still work well! These single serve cupcake containers are perfect for displaying your product. Easily viewable from any angle, this is a great way to showcase your cupcakes. I am very pleased with this product!!! I searched quite. a few places and was never satisfied until I found this site!. I am really pleased. This is a great container for selling individual cupcakes. It is plenty large enough for a jumbo cupcake or muffin as well. Will order again. I Loved these cupcake holders. They are sturdy and kept my cupcakes snug. I was able to place my label in the center and they looked amazing. These arrived in great condition and were fine in theory but the tops of these are large and square so I felt there was too much wasted space for using them for muffins and cupcakes. I used these for cupcakes. They are definitely not cupcake containers! Probably perfect for muffins but the cupcakes could still move around too much! But they shut tight. I love the quality of these muffin takeout containers. We use them for our cupcakes in our bakery. The compartment is a little bit bigger than our actual cupcake, but it holds it in place good. Great overall product. Works great for a single cupcake. Only downside is they don't stack well. Can sometimes take a second or two to get the container to close securely. These containers were not exactly what I expected but they still work great. I didn't notice the part of the description that stated that fit both standard AND jumbo cupcakes. They work for my standard cakes but aren't quite as stable as I would have liked. Still, for the price, I am quite satisfies and will order more. THESE CONTAINERS ARE PERFECT! THEY FIT BOTH A JUMBO AND REGULAR CUPCAKE- JUST WATCH THE HEIGHT OF THE ICING ON A JUMBO CUPCAKE. I WILL BE REORDERING THESE. We used these single muffin containers to hold cupcakes for a cupcake walk at a children's festival. They worked well, though were a touch big for a standard sized cupcake. They will be fantastic for jumbo sized muffins, and the top is tall enough that jumbo sized, decorated cupcakes could easily be packaged in them also. Great for a single Jumbo cupcakes! Love these containers! Will buy again. With so many in the case, you will have for a long time. These work great for our cupcakes with tall frosting decoration. Yes, as other reviews mentioned the holder part is intended for a large muffin, but we're not transporting our cupcakes at all, they just go into our store, so a bit of movement isn't a problem for us. Work great! Great container, use them for our over large muffins and cupcakes! Great display container, makes our product look really nice!! Will continue to purchase this itiem!! These cupcake containers serve multiple purposes in my shop. We put individual cupcakes to go in them and we also flip them upside down and put four mini cupcakes in them. These containers are the perfect fit for our jumbo cupcakes we sell.. They are exactly what we needed and the price was a good deal compared to other sites. These containers are great for tall decorations! The formed compartment keeps the cupcake from moving around especially when little ones want to hold their cupcakes! I love these cupcake containers! They seemed a little big at first but customers really appreciate the sturdy build for transport and I appreciate the way the cupcakes or muffins hold up for sale in the stores I sell to ! They fit jumbo muffins and cupcakes well and have plenty of room for frosting . We used these for the first time in my small bakery and I found them to be substantial and easy to close unlike other kinds. They have a nice circular indentation which holds a muffin or cupcake steady. They are very clear and attractive. I would buy these or related products by the same company again. We use these single containers daily in our cupcake shop. We use them for standard size cupcakes, but we also flip the container over to put cinnamon rolls in-duel purpose! There is plenty of room in the top of the container for you toppings and icing. I have never been disappointed with anything I have purchased from Webstaurant.com. These are ideal for my business when I set up events and people want 1 cupcake instead of 6 or 12. Really helps turn a profit in my business! Had to send item back. The container was too big for cupcakes. This container would be perfect for huge muffins. Although it was not right for me, it is still a good product. Thank you for the feedback! We're sorry this did not suit. Our Customer Solutions team is always happy to help! i found these containers to be too big for a regular cupcake. The price is very reasonable and great value and the product is great quality. it was just not the right size for my needs. I purchased these because they were less expensive then the cupcake single box. they arrived fast to me and the look nice with a cupcake in them. I brought this single cupcake containers for regular size cupcakes. But it's a little bigger than that. It did say muffin container so my mistake. But it will be good for jumbo cupcakes, that's what I will use it for. Excellent quality, very sturdy and holds single cupcakes perfectly, the lid is high enough and will not mess up your frosting. We use these at the farmers markets and makes our business look professional! While this product has crystal, clear plastic for good visibility, is sturdy, easy to open, and a great height to keep from smushing frosting... the site description could use some clearing up. These are for 'jumbo' cupcakes or muffins. The 5 oz. size denotation wasn't enough for me to realize just how much my standard sized cupcakes would shift in the well. Love. Love. Love these containers! They hold an jumbo cupcake and all its frosting wonderfully! I ordered some to try and ended up ordering more! I read the other reviews and decided to take the plunge. After all, 100 containers for this price is pretty darn great! I used the containers to put regular sized cupcakes into them to provide to my customers. I found the containers to be too large for my cupcakes. I believe a jumbo cupcake/muffin would fit more nicely. I was also worried about the icing being too high and that was not the case. The lid height is perfect. Perfect size for regular size cupcakes. I use these containers for vendor shows and they are great. I have ordered multiple times because the price is better than other places I have looked. I like the container and the well is deep enough that it holds the cupcake snug in transport. The top is high enough that if you don't get too crazy with the icing then it will be fine. We bought these for selling single serve cupcakes in our business. They are the perfect size, easy to decorate the cupcake right inside of them and look great for a professional look. In addition to our normal yogurt business, we also sell assorted pastries, including muffins. Not everyone eats them in the store, but until we bought these, we had no good take out option. These work really well for us, and we haven't had much trouble closing them. For our small shop, they work great. No issues. I was so glad to find these. We sell desserts to folks finishing dinner in addition to being a chocolate shop; many folks come in and just want 1 or 2 cupcakes, rather than buying an entire half dozen. These containers work great, securely holding the cupcakes within plenty of room for the frosting on the top. No more sliding around and flipping over like happened with the clamshell containers we tried at first. I Love These! There perfect for my cupcakes. I sell them individually and with these containers it makes it real easy, im for sure gunna purchase again . These are almost impossible to close. It is so embarrassing to have customers watch you fumble around to try to get their cupcake container to close. The shipping also was over a week! Thank you for your review! We are sorry you did not like the take out containers you purchased. 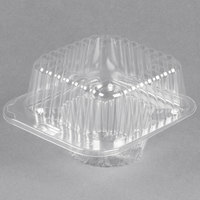 Try these Swirl Dome 1 Compartment Hinged Clear Cupcake Container for an easy to close container. Just press around the perimeter to tightly close the compartment. Very convenient and useful. Ideal for cupcakes although they say it's for muffins. Perfectly sizes , not too big and very easy to stack. But the best part is the price.